South Australia takes first step to nuclear power GEORGE LEKAKIS The New Daily, Financial Services Editor 9 Feb 15“……..The setting up of the Royal Commission follows lobbying by prominent South Australian business figures for an independent evaluation of nuclear power and enrichment proposals for the state……..South Australian Nuclear Energy Systems has been discussing its business proposals with Federal and State politicians, with a view to amending laws that ban nuclear power generation. The Commonwealth Biodiversity Act currently prohibits the deployment of nuclear power stations throughout Australia.Mr Hundertmark told The New Daily last year that the company had identified international capital sources for funding local nuclear projects and had formed connections with global players. Former Nuclear Regulatory Commissioner and state regulator Peter Bradford sees the finance issue as the nuclear industry’s Kryptonite. Straight.com. Peter Dykstra, 9 Feb 15 “…In recent years, some major science and environmental players have come forward to endorse nuclear power. Former EPA administrator and Obama climate czar Carol Browner is one of the glitziest. Browner signed up for the newest and shiniest effort to sell nuke plants, the year-old Nuclear Matters, founded by electric giant Exelon in 2014. Nuclear Matters is run by public relations agency Sloane & Associates. Critics call it a nuclear front group, but Sloane prefers to bill it as “starting a national conversation on nuclear power,” and adds that other utilities, nuke builders and suppliers have joined Exelon as sponsors. The group recruited several other bipartisan political heavyweights as paid spokespeople but none that are catnip for the environmental community, where opposition to nuclear power is the rule, not the exception. So when Nuclear Matters hauled in Browner as a spokesperson of its Leadership Council last year, she was a big catch. Browner said she typically devotes a few hours a week to Nuclear Matters and is compensated for her time, but neither she nor Nuclear Matters will discuss her fee. In late January, she appeared at a Nuclear Matters event in Chicago……..Browner was reluctant to discuss the current financial struggles of multiple nuke plants, and acknowledged that the industry was still “trying to figure out” the unsolved problems of nuclear waste storage. Since launching in Washington last April, it’s difficult to determine the impact the Nuclear Matters campaign has had. But Browner is far from the only convert. James Lovelock …..Lovelock stood on the extreme edge of the scientific community with his bleak climate views, and eventually walked them back, affirming in 2012 that climate change was real, but not to the “alarmist” extent he’d thought. In another interview that year with Nature, Lovelock stuck by his nuclear guns, downplaying the nuclear accidents at Fukushima and Chernobyl. Stewart Brand has been one of Ken Kesey’s Merry Pranksters, an LSD-loving Grateful Deadhead, founder of the Whole Earth Catalog, and inventor of something that vaguely preceded the computer mouse. Ten years ago, Brand published a manifesto called “Environmental Heresies” in which he denounced “romantic” environmentalists and what he perceived as a reluctance to embrace genetic engineering. And he stuck a flag in the ground in favor of nukes as a climate fix…. Christine Todd Whitman New Jersey Governor in the 1990’s and George W. Bush’s first EPA Administrator, Whitman signed on to a paid position as co-chair of the Clean and Safe Energy Coalition (CASE), organized by the Nuclear Energy Institute, the primary trade association for nuclear in the U.S. Like Browner and Nuclear Matters, Whitman acknowledges that she is compensated, but has declined to disclose how much she or her consulting firm are paid…….Whitman continues to co-chair CASE. NEI’s site lists dozens of op-eds and media appearances by Whitman, including a defense of Georgia Power’s rate increases to fund construction of new reactors near Augusta. Patrick Moore Billing himself as a founder of Greenpeace (the organization, where I once worked, disputes this), Pat Moore switched sides in dramatic fashion. He’s now a vocal critic of Greenpeace and the entire environmental movement and a ubiquitous spokesman for an array of industries with environmental image problems. He was a compensated pitchman for CASE and the Nuclear Energy Institute for a decade, though neither Moore nor NEI will say for how much. He announced his retirement in 2013, but last February, he appeared in print and radio ads touting nuclear’s “low carbon” energy as a fix for climate change. NEI posted the video ad on YouTube on February 24, 2014. A day later, Moore testified before the House Science Committee that human-caused climate change is unproven.……. Rajendra K. Pachauri Pachauri has chaired the Intergovernmental Panel on Climate Change, the United Nation’s gold-standard climate science group, since 2002. ……In a discussion in Atlanta last month, Pachauri echoed IPCC’s recommendation for nukes: “You’ve got to look at nuclear. Some countries will, some countries won’t.” Pachauri’s native India is one that will. Indian Prime Minister Narendra Modi struck a deal last month with President Obama that could open the door for U.S. contractors to build new nuclear plants in India. George Monbiot British environmental journalist Monbiot made a sharp turnaround on nuclear in 2011, but don’t expect to see the industry featuring pull quotes from him. “Yes, I still loathe the liars who run the nuclear industry. Yes, I would prefer to see the entire sector shut down, if there were harmless alternatives. But there are no ideal solutions. …. Critics say two crucial vulnerabilities of nukes go unaddressed in U.S pro-nuke pitches: unresolved questions about nuclear waste disposal, and Wall Street’s wariness about the industry. Nuclear power plants currently store their waste on-site. Intended as a stop-gap method until a national nuclear waste repository is built, on-site storage in above-ground containers may be as good as permanent, since plans for the Yucca Mountain repository north of Las Vegas were halted by the Obama Administration after decades of delays. Former Nuclear Regulatory Commissioner and state regulator Peter Bradford sees the finance issue as the nuclear industry’s Kryptonite. “Wall Street doesn’t want (reactors), the utilities don’t want them,” said Bradford, who is also Vice-Chair of the Board of Directors of the Union of Concerned Scientists. UCS is officially neutral on the use of nuclear power, but has often criticized what it sees as safety and financial vulnerabilities in the industry. Greenhouse gases are emitted in all stages of the lifecycle of a nuclear reactor: construction, operation, fuel production, dismantling and waste disposal. Leaving out any of these five stages will bias estimates towards lower values. The last two contributions, dismantling and waste disposal are particularly difficult to estimate. Not many commercial reactors have been fully decommissioned. Also there is still no scientific or political consensus on the approach to be used for the long-term storage of waste. The fuel preparation contribution is also problematic. Considerable amounts of carbon are released in the mining, milling and separation of the uranium from the ore. Also the carbon emitted is very dependent on the concentration of uranium in the ore.
It’s important to appreciate that these three problematic contributions, fuel production, dismantling and waste disposal are either non-existent or small contributions in the case of electricity generation by renewable technologies. Estimates of the carbon footprint of renewably generated electricity therefore should be much more reliable than those for nuclear. 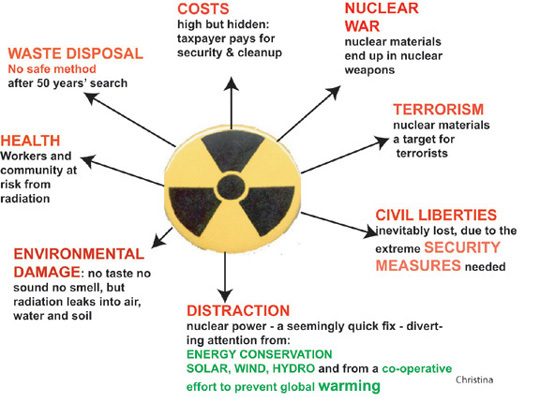 A False Solution Why Nuclear Power is Not “Low Carbon”, CounterPunch, by KEITH BARNAM, 5 Feb 15 The UK government is committed to massively subsidising new nuclear reactors, based on the claim that they generate ‘low carbon’ electricity. But what is the carbon footprint of nuclear power? I have trawled the literature and found that there is no scientific consensus on the lifetime carbon emissions of nuclear electricity. Remarkably, half of the most rigorous published analyses have a carbon footprint for nuclear power above the limit recommended by the UK government’s official climate change advisor, the Committee on Climate Change (CCC). According to the CCC, if we are to avoid the worst effects of climate change, by 2030 all electricity should be generated with less than 50 grams of carbon dioxide emitted for each kilowatt-hour (50 gCO2/kWh). Since all new generators have lifetimes well over 20 years, I believe this limit should be imposed on all new electricity supply systems here and now – and all the more so for those with lifetimes spanning many decades. Note that thanks to long construction times for the EPR design and a forthcoming legal challenge, it’s entirely possible that the planned Hinkley C reactor will not be completed until 2030 or beyond. It will then be subsidised for the first 35 years of its projected 60 year lifetime – taking us through until 2090. What is the carbon footprint of renewable electricity? When comparing the carbon footprints of electricity-generating technologies, we need to take into account carbon dioxide emitted in all stages in the life of the generator and its fuel. Such a study is called a life cycle analysis (LCA). There are other gases such as methane that are more dangerous greenhouse gases than carbon dioxide. The most reliable LCAs take all greenhouse gases into account and present equivalent carbon dioxide emissions. In a recent paper in Energy Policy, Daniel Nugent and Benjamin Sovacool critically reviewed the published LCAs of renewable electricity generators. All the renewable technologies came in below the 50 gCO2/kWh limit. The lowest was large-scale hydropower with a carbon footprint one fifth of the CCC limit (10 gCO2/kWh). A close second was biogas electricity from anaerobic digestion (11 gCO2/kWh). The mean figure for wind energy is 34 gCO2/kWh, and solar PV comes in a shade under the 50g limit, at 49.9 gCO2/kWh. Bear in mind that rapidly evolving PV technology means that this last figure is contantly falling. What’s the carbon footprint of nuclear power? There have been nearly three hundred papers on the carbon footprint of nuclear power in scientific journals and reports in recent years. Two peer-reviewed papers have critically assessed the literature in the way Nugent and Sovacool compared renewable LCAs. The first was by Benjamin Sovacool himself . He reviewed 103 published LCA studies and filtered them down to 19, which had an acceptably rigorous scientific approach. The carbon footprints ranged from 3 to 200 gCO2/kWh. The average carbon footprint was 66 gCO2/kWh, which is above the CCC limit. In 2012, four years after Sovacool’s paper, Ethan Warner and Garvin Heath found 274 papers containing nuclear LCAs . They filtered them down to 27 for further consideration. These yielded 99 estimates of carbon footprints which the authors describe as “independent”. Their data for carbon emissions ranged from 4 to 220 gCO2/kWh. They did not report an average but rather a median value: half the estimates were below 13 gCO2/kWh. These two reviews of the published literature, often called meta-analyses, produced conflicting results. One suggests the carbon footprint is above the CCC limit, the other well below. Looking in more detail at the Warner and Heath meta-review it becomes clear that their 99 estimates are not all ‘independent’ – in the sense of independent from each other – as they come from only 27 papers. In fact, a significant number of their 99 estimates come from LCAs that have varied one or more of the assumptions in their calculations: for example the concentration of uranium in the ore, the geographic location of the reactor or the type of reactor. Treating these variations as ‘independent’, as Warner and Heath do, gives undue weight to studies that report a large number of different assumptions for the same LCA model. We will see that these are mainly analyses which report low carbon footprints. It is therefore not surprising that Warner and Heath’s median is so much lower than Sovacool’s average. I believe it more appropriate to present these different estimates from the same LCA as an average and a range of values. This I have done for the most rigorous of the LCAs. Another concern with the Sovacool and Warner-Heath reviews is that among their selected LCAs there are, in both reviews, some analyses that do not include all the five stages in the nuclear lifecycle. I have reviewed the LCAs of all the light water reactors and pressurised water reactors that passed the selection procedures of either the Sovacool or the Warner-Heath meta-analyses. I have further refined their selection by excluding any LCA that does not estimate a carbon footprint for all five stages of the life cycle. Only eight LCAs survive. The figure shows the carbon footprints of the eight LCAs that pass this more rigorous test. All eight LCAs considered different assumptions that resulted in a range of estimates for the carbon footprints indicated by the vertical error bars. The circles show the average carbon footprint in the range of estimates. The most important point to notice in the figure is that four of the circles fall below the horizontal broken line at 50 gCO2/kWh and four above. Half the most rigorous of the published LCAs are below the CCC limit and half are above. The conclusion from the eight most rigorous LCAs is therefore that it is as likely that the carbon footprint of nuclear is above 50 gCO2/kWh as it is below. The evidence so far in the scientific literature cannot clarify whether the carbon footprint of nuclear power is below the limit which all electricity generation should respect by 2030 according to the CCC. Another important point to notice in the figure is that the spread of the estimates is smallest for the two lowest LCAs (references 4 and 5). These two LCAs only considered a small range of assumptions in their LCA models. However they considered a large numberof different assumptions (13 in the first reference and 9 in the second) compared with many of the higher carbon footprint LCAs. Warner and Heath consider these 22 estimates as ‘independent’. This is why the median (13 gCO2/kWh) of their 99 estimates is so low compared to Sovacool’s average. I am surprised that the peer-reviewers for the Journal of Industrial Ecology did not object to this seriously flawed methodology. As we have seen, the EPR’s very high cost suggests considerably higher emissions in the construction stage. So too does the fact that, over its projected 60-year lifetime, it will be using uranium from very low quality ores. The likely delay due to the Austrian appeal against the European Commission’s decision on the EPR subsidy offers an opportunity for a full, independent and peer reviewed assessment of the environmental impact of this complex and expensive new technology. Nuclear fuel preparation begins with the mining of uranium containing ores, followed by the crushing of the ore then extraction of the uranium from the powdered ore chemically. All three stages take a lot of energy, most of which comes from fossil fuels. The inescapable fact is that the lower the concentration of uranium in the ore, the higher the fossil fuel energy required to extract uranium. Table 12 in the Berteen paper confirms the van Leeuwen result that for ore with uranium concentration around 0.01% the carbon footprint of nuclear electricity could be as high as that of electricity generation from natural gas. This remarkable observation has been further confirmed in a report from the Austrian Institute of Ecology by Andrea Wallner and co-workers. They also point out that using ore with uranium concentration around 0.01% could result in more energy being input to prepare the fuel, build the reactor and so on, than will be generated by the reactor in its lifetime. According to figures van Leeuwen has compiled from the WISE Uranium Project around 37% of the identified uranium reserves have an ore grade below 0.05%. A conservative estimate for the future LCA of nuclear power for power stations intended to continue operating into the 2090s and beyond would assume the lowest uranium concentration currently in proven sources, which is 0.005%. On the basis that the high concentration ores are the easiest to find and exploit, this low concentration is likely to be more typical of yet to be discovered deposits. Using 0.005% concentration uranium ores, the van Leeuwen, Berteen and Wallner analyses agree a nuclear reactor will have a carbon footprint larger than a natural gas electricity generator. Also, it is unlikely to produce any net electricity over its lifecycle. What is the carbon footprint of the ‘Third Generation’ reactor at Hinkley Point C? * The two prototypes for the European Power Reactor (EPR) proposed for Hinkley Point are still in the construction stage and are well behind schedule. In all engineering projects the completion of a prototype results in modifications to the construction that cannot be predicted beforehand. That is the reason for building a prototype. Also, until the reactor has run for a period, it will not be clear if it will achieve its design power output and how long it will operate between refuelling. These latter two factors are important in estimating the total amount of electricity the EPR will generate in its lifetime. The carbon emissions are divided by the total amount of energy to get a carbon footprint. * The EPR is far bigger and more complex, than any existing nuclear reactor, or indeed any electricity generating system ever built. Major design modifications have to be included to incorporate lessons learnt from the Fukushima disaster. This all means not only has the cost of the EPR risen, and will continue to rise with the prototype modifications, but also carbon emissions during the construction stage will be expected to be higher than these of current reactors. * The intention is that fuel rods of the EPR will remain longer in the core than in today’s reactors in an attempt to reduce the cost of the electricity. This will mean that the spent fuel will be more radioactive resulting in new challenges in dismantling reactors and in dealing with the waste. Inevitably, this will lead to higher carbon footprints. Given these three factors it is surprising that a report commissioned by the CCC in 2013 claims a carbon footprint for the EPR of 6 gCO2/kWh, comparable with the lowest two LCAs in the figure. The report is from the company Ricardo-AEA, formed in 2012 when Ricardo acquired AEA Technology, itself a spin-out from the United Kingdom Atomic Energy Authority. Their analysis makes the astonishing assumption that both the EPRs at Hinkley Point C will operate at 1 GW above their design power for 85% of every year over a 60 year lifetime. This is a remarkably optimistic projection that gives an unrealistically high total for electrical energy generated in a lifetime. But this is only one reason for the very low carbon footprint. The Ricardo-AEA report quotes the spread of results from the Warner-Heath analysis. However, they compare their result with six other LCAs that all have carbon footprints below 8 gCO2/kWh. Three are from reference  and three are not included in the Warner-Heath study. The report does not explain why their result differs so much from the results of the majority of the LCAs in the Warner-Heath review. Massive amounts of taxpayers’ money should not be committed to this project on the basis of such a flimsy scientific assessment of environmental impact. In my book, The Burning Answer: a User’s Guide to the Solar Revolution, I discuss a simple comparison of the LCAs of the EPR and a large dam (or probably dams) producing the same amount of power. The carbon footprint of hydropower, 10 gCO2/kWh, is much better known than nuclear. Many large dams have been constructed and uncertainties such as carbon emissions during fuel production and long term storage of waste do not apply to hydropower. First let’s compare the construction costs. The cost of building the first 1.6 GW EPR at Hinkley Point is around five times higher than the cost of building the hydropower dams which provide the same electrical power. This higher price suggests higher carbon emissions. The EPR price reflects the high cost of more sophisticated nuclear engineering, manufacturing and transporting a steel pressure vessel, expensive high precision nuclear components, steam generators and safety systems. Many of these additional costs for the nuclear option result from burning fossil fuels directly in manufacture or transport or in the generation of electricity in all stages of construction. The fact that the EPR costs five times the hydropower option suggests the construction could result in up to five times larger carbon emissions than dams that give the same power. This approach was first suggested by Hans Bethe, the physics Nobel Prize laureate, in the 1960s, and has been widely used by both companies and governments as a first estimate of their carbon footprints. Assuming the reactor and the dams have the same lifetimes, and generate for the same time each year, the carbon footprint in grams of CO2 for each kWh of energy could be up to five times higher for the EPR than for hydropower: hence around 50 gCO2/kWh. But note: this rough estimate is only for the carbon dioxide emitted during construction. It ignores the carbon emitted during the problematic three nuclear stages, fuel production, dismantling and waste disposal. This simple argument suggests to me that – as for the first and second generation – there is as yet no solid scientific evidence that the carbon footprint for the EPR will be below the CCC recommendation of 50 gCO2/kWh. Indeed once the additional carbon emissions are taken into account, it’s certain to be considerably above that figure. So the claim that the carbon footprint of the EPRs planned for Hinkley C will be as low as 6 gCO2/kWh, less even than hydropower – as claimed in the Ricardo-AEA report commissioned by the CCC – is wholly incredible. The UK government should follow good engineering and good investment practice and undertake full due diligence before signing a contract to subsidise the EPR. This should include a complete and thorough LCA of greenhouse gas emissions including data on the performance of a working prototype. The likely Austrian appeal against the European Commission’s approval of the subsidy may delay the contract signing beyond the 2016 completion date for the EPR. In any case, it is extremely bad engineering and bad investment practice to sign a contract before a prototype operates. The LCA should be subject to thorough review by independent experts as is the case for technical due diligence for commercial investment. The Hinkley C project is surely Britain’s largest and most expensive electricity generating project. It is certainly the most complex. At the present time the UK government is keen to sign a contract with French and Chinese companies, many of which are owned by their governments, to build the project. The contract will commit the UK public to paying heavy subsidies and may be signed before it is known if the prototype works or what its environmental impact will be. This would be engineering, investment and, possibly, political stupidity. There is no consensus in the scientific literature as to the carbon footprint of existing nuclear reactors. I have more confidence in the six highest LCAs because two of them have been independently re-assessed and – in contrast to the two lowest LCAs – the higher analyses have taken realistic account of the uncertainties in the three most problematic parts of the nuclear life cycle. As all six are either above, or have error bars that reach above, the CCC’s 2030 threshold of 50 gCO2/kWh, the balance of the evidence of the six most robust LCAs is that the carbon footprint of nuclear power is above the CCC’s recommended limit. And of course these figures apply to existing nuclear power stations, not the EPR design planned for Hinkley C. As we have seen, the EPR’s very high cost suggests considerably higher emissions in the construction stage. So too does the fact that, over its projected 60-year lifetime, it will be using uranium from very low quality ores. Keith Barnham is Emeritus Professor of Physics at Imperial College London, where his group developed a third generation solar cell with three times the efficiency of current rooftop PV. He co-authored the only published study of plutonium production in UK civil reactors. He is author of The Burning Answer: a User’s Guide to the Solar Revolution, published by Weidenfeld and Nicolson. ISBN 9780297869634. The author wishes to acknowledge the valuable assistance of Neal Powell, Benjamin Sovacool and Storm van Leeuwen. The nuclear industry giving credence to climate change from fossil fuels has simply led to a stronger renewables industry. …….There remains one piece in the jigsaw and that is to abandon climate change as a prime argument for supporting a much higher use of nuclear power to satisfy rapidly-rising world power needs……. We have seen no nuclear renaissance (instead, a notable number of reactor closures in some countries, combined with strong growth in China) the story has not changed very much. The 2014 edition of the International Energy Agency’s World Energy Outlook shows nuclear playing a small but indispensable part in those scenarios maintaining greenhouse gas emissions at much lower and environmentally safer levels to 2030 and beyond. ………. The International Atomic Energy Agency has also just released the 2014 edition of its publication Climate Change and Nuclear Power which addresses the perceived need for a lot more nuclear power for this reason, together with the range of issues which inevitably surround this transition. The problem is that the hoped-for process is not working. Countries such as Germany and Switzerland that claim environmental credentials are moving strongly away from nuclear. Even with rapid nuclear growth in China, nuclear’s share in world electricity is declining. The industry is doing little more than hoping that politicians and financiers eventually see sense and back huge nuclear building programmes. On current trends, this is looking more and more unlikely. The high and rising nuclear share in climate-friendly scenarios is false hope, with little in the real outlook giving them any substance. ….The nuclear industry giving credence to climate change from fossil fuels has simply led to a stronger renewables industry. Nuclear seems to be “too difficult” and gets sidelined – as it has within the entire process since the original Kyoto accords. And now renewables, often thought of as useful complements to nuclear, begin to threaten it in power markets when there is abundant power from renewables when the wind blows and the sun shines. Newly released documents show that the US government drew up a plan in April of 1956 for how to deal with an impending nuclear war. What was its strategy? Declaration of martial law, evacuation of top American personnel to secret offices, and the immediate detention of over 12,000 people with ties to “subversive organisations.” It was called Plan C.Muckrock has obtained these new Cold War-era documents detailing the doomsday scenario through Freedom of Information Act requests sent to the FBI.Plan C evolved and changed as different people in the chain of command got involved. At one point, Plan C was envisioned as a measure that would be implemented before any potential war might start. In other iterations, it was to be the course of action only after nuclear war with the Soviets had begun. On November 22, 1955 the Soviet Union first successfully detonated a hydrogen bomb, finally catching up to the United States with its nuclear tech capabilities. The H-Bomb was roughly 1000 times more powerful than the atomic bombs that had been dropped on Japan a decade earlier, and more than ever, the US was concerned about the prospect of worldwide nuclear annihilation. By April of 1956 it had drafted its new emergency response. One aspect of Plan C was the implementation of an emergency program to arrest precisely 12,949 individuals whose “affiliations with subversive organisations” made them a threat to the security of the United States. “Enemy diplomats” were to be arrested as well. The newly released documents don’t include who precisely was on these lists.Was there a Plan D? You bet. Plan D involved the relocation of all high ranking government personnel to secret locations. It was part of “Operation Alert, 1956″, which was tested in July of 1956. Details of the CIA’s plan for Operation Alert 1956 were released in 2009. As Muckrock notes, Plan C was never distributed widely and details of the plan were ordered destroyed in July of 1957. Only about 30 pages about Plan C have been released so far. There are roughly 150 more pages that are still being processed. Some of the remaining unreleased documents are being looked over by FEMA. We’re no longer embroiled in the middle of a Cold War. Or at least we’re not supposed to be. But you can bet that the US government has all kinds of contingency plans in place in the event of nuclear war or the like. Do those plans include martial law and the rounding up of people considered subversive? I suppose we’ll find out in another 60 years. Provided we’re lucky enough to avoid nuclear war in the first place. You can read all of the documents released by the FBI about Plan C over at Muckrock. NEW ZEALAND ROBUSTLY DEFENDS NUCLEAR BAN Eurasia Review FEBRUARY 1, 2015 BY NEENA BHANDARI The small Pacific island country of New Zealand has punched above its weight in the international disarmament debate. For nearly three decades it has pursued an active nuclear free policy, banning entry of US warships carrying nuclear weapons or propelled by nuclear power into its ports despite being part of the ANZUS Treaty. NZ, along with the United States (US) and Australia, was amongst the three original signatory governments to the ANZUS treaty, a trilateral framework for security arrangements and cooperation, which was concluded in 1951. From the mid-1960s to the mid-1980s, New Zealand opposed French nuclear tests in the Pacific. In 1983, the visit of the nuclear-powered frigate USS Texas sparked protests. Ordinary people spurred an anti-nuclear movement, which reached its peak in the mid-1980s and shaped NZ’s foreign policy and identity as a nation. The defining moment came in July 1985 with the sinking of the Greenpeace flagship, Rainbow Warrior, which had been involved in protests over French nuclear testing. The then Prime Minister David Lange said: “There is only one thing more dangerous than being attacked by nuclear weapons and that is being protected by them.” In 1987, the Labour government passed the New Zealand Nuclear Free Zone, Disarmament, and Arms Control Act. “The legislation is now so well entrenched in the New Zealand psyche, that no party would propose rescinding it in the future. The National Party (the leader of the current government) has now said explicitly that they would not repeal that legislation,” Maryan Street, former NZ Labour Party Spokesperson on Disarmament and Arms Control, told IDN………. NZ’s clean green image further promoted as 100% Pure by the Tourism NZ campaign is partly to do with the country being nuclear free. It doesn’t have nuclear power so the chances of a localised accident occurring are slim. NZ has been very active in highlighting the humanitarian consequences of nuclear weapons in direct contrast to Australia. By October 2014,155 countries had signed the NZ-led UN statement on the humanitarian consequences of nuclear weapons. Agrees Kennedy Graham, Green Party MP with responsibility for global affairs. “There is multi-party support now for New Zealand’s Nuclear Free Zone legislation.”………………..
Successive opinion polls in Australia have shown that Australians overwhelmingly reject nuclear weapons. “Yet our government, in deference to the US, remains opposed to the idea of a treaty banning these ultimate weapons of mass destruction. We are calling on the government to rule out any role for nuclear weapons in our nation’s military doctrines, just as New Zealand did in the 1980s, and to join efforts to achieve a global ban”, Australia Director of the International Campaign to Abolish Nuclear Weapons (ICAN), Tim Wright, told IDN. Radon’s Deadly Connection With Uranium Mining As Seen From Navajo Nation, Indian Country, Konnie LeMay 2/2/15 Where you live may increasingly become as important as how you live in determining your health as we continue to recognize how environmental factors affect our lives and may hasten our deaths. “No longer can we just kind of sit back and say those are all just lifestyle (influences) … just stop eating frybread and throw some vegetables in there,” said Chris Shuey, director of the Uranium Impact Assessment Program for theSouthwest Research and Information Center. Radon is a colorless, odorless gas that develops when naturally occurring radioactive materials breakdown and is listed as the second-leading cause of lung cancer in the United States and Canada. It is the leading cause of such cancer in non-smokers and is linked to as many as 20,000 lung cancer deaths annually in the United States – whereNational Radon Action Month just past in January. In 1556 a German scholar first noted the high mortality rate of miners in Eastern Europe, and 300 years later, autopsies revealed chest tumors were the likely cause of death in miners, according to areportby Drs. Howard Frumkin and Jonathan M. Samet. Radon, first called “niton” wasn’t identified as an element until 1900. The Indian country radon-and-mining connection first arose with on-going studies, started in the 1950s through the U.S. Public Health Service. The studies includedNavajo uranium miners. These studies were the catalyst for the 1990 Radiation Exposure Compensation Act allotting compensation money to eligible miners and attaching this apology: “The Congress apologizes on behalf of the Nation to the (affected individuals) and their families for the hardship they have endured.”…….. While it is true that some previously anti-nuclear activists and advocates have moved over to the nuclear side on account of their new conviction that nuclear is essential to curb climate change, these are very uncomfortable bedfellows. They are likely to do as much damage to the nuclear case as good. The industry has hailed the recent “Pandora’s Promise” movie, but the five new nuclear disciples look rather like enemy turncoats in a war-time propaganda movie, trying to urge their former colleagues also to “see the light”. Why, after so many years of being “wrong”, should anyone have faith in the new (and apparently deeply-held) convictions of these people? Will they not change their minds again once the wind changes? Why on earth would one cosy up to the very people who killed your market in the first place because their foolish advocacy led to much higher costs? Their general lack of soundness is invariably amplified by attaching themselves to next generation reactor technologies, thorium or whatever. …….